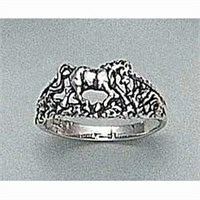 Order Horse and Equestrian Theme rings and jewelry online in a variety of styles. 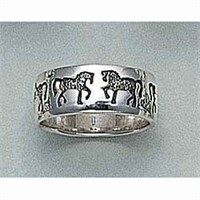 A parade of trotting horses forms a cutout design on this wide band in polished sterling silver. 3?8" wide. Whole sizes: 5-11. Gift boxed. Lucky horseshoe ring features uniquely sparkling marcasite with a rope trim design on rhodium-plated brass. Horseshoe is 1/2" high. Whole sizes: 5-9. Gift boxed. Sparkly silvertone concho features crystals and a goldtone horseshoe over an etched floral design. Concho is 1 1?4" diam. Elasticized band stretches to fit most sizes. Gift boxed. Lucky horseshoe ring in antiqued sterling silver features a Western tooling design on the sides. Horseshoe is 3/8" high. Whole sizes: 6-10. Gift boxed. A squared-off horseshoe nail ofsterling silver is twisted into a disinctive handcrafted ring. Whole sizes 5-9 (slightly adjustable). Crafted in USA. Gift boxed. The flowing mane of this beautiful horse head gives this sterling silver ring a graceful beauty. Antiqued finish. 5/8" high. Whole sizes 5-10. Gift boxed. This sterling silver ring is embellished with blue & clear rhinestones & features a buckle design. Jewelry is protected with a rhodium plating. This plating helps add a rich elegant look and also provides a protective layer from elements that cause silver to tarnish. Sparkly brown rhinestones embellish front. Clear rhinestones accents buckle. A beautiful ring by Kelly Herd to accent your western outfit! This ring features quality sterling silver construction. Lovely brown rhinestones embellish front. Clear rhinestones adorn buckle decoration. Horseshoe ring with interchangeable rhinestone ring. Get three different looks. Get an exquisite look with jewelry from Kelly Herd! This sterling silver ring features two horseshoe designs. Set includes three rings lined with red, green or blue rhinestones that each slide into the larger horseshoe ring. Jewelry is protected with a rhodium plating. This plating helps add a rich elegant look and also provides a protective layer from elements that cause silver to tarnish. This sterling silver ring features a rhinestone buckle design. Jewelry is protected with a rhodium plating. This plating helps add a rich elegant look and also provides a protective layer from elements that cause silver to tarnish. Tiny rhinestone lined offset horseshoe charm. This sterling silver ring features a small rhinestone embellished offset horseshoe charm. Jewelry is protected with a rhodium plating. This plating helps add a rich elegant look and also provides a protective layer from elements that cause silver to tarnish. Tiny rhinestone lined horseshoe charm. This sterling silver ring features a small rhinestone embellished horseshoe charm. Jewelry is protected with a rhodium plating. This plating helps add a rich elegant look and also provides a protective layer from elements that cause silver to tarnish. Sterling silver construction. Rhinestone embellished nail ring. Get an exquisite look with jewelry from Kelly Herd! This sterling silver ring boasts a rhinestone embellished nail design. Jewelry is protected with a rhodium plating. This plating helps add a rich elegant look and also provides a protective layer from elements that cause silver to tarnish. .925 sterling silver with rhodium plating. Thin band with cubic zirconia stone inset. Horse bit design. Available in whole sizes 5-9. Vendor Style: S2T. Imported. Show off your love of all things equestrian with a beautiful horse bit ring by Kelly Herd. This lovely and simple womens ring is made of genuine.925 sterling silver with rhodium plating to prevent tarnishing and make the ring look its best. Cubic zirconia stone accents on the band sparkle in their silver setting. Kelly Herd makes quality jewelry with western charm. Sterling silver construction. Rhinestone embellished wrap around nail ring. Get an exquisite look with jewelry from Kelly Herd! This sterling silver ring boasts a wrap around rhinestone embellished nail design. Jewelry is protected with a rhodium plating. This plating helps add a rich elegant look and also provides a protective layer from elements that cause silver to tarnish. This finely crafted horse ring is the perfect piece of jewelry for any horse enthusiast to add to their collection. Commemorate your special love of horses with this luxurious ring that is finely crafted from sterling silver. Our high quality horse ring is sure to catch the eye of all who see it and you will receive so many compliments on its quality and beauty. All other rings pale in comparison. Others will be envious and your silver horse ring will be a conversation starter at any gathering. Ride like the wind and amaze your family, friends and co-workers with the equine elegance of this lovely Horse Ring. Skillfully hand crafted from shining sterling silver, the Horse Ring will have everyone galloping in admiration. The wonderfully detailed Horse images prance completely around the ring with playful abandon. Choose from ring sizes 6-9 and give these frolicking fillies to every special person in your life. Horse Rings are amazing gifts and are a must have for any Jewelry collection. A ring for the equestrian enthusiast! Handcrafted of sterling silver. Shadow box horse head design. Available in a wide range of men's & women's sizes. This western ring is an alternative to flashy jewelry! Our handcrafted sterling silver Horseshoe Ring is for the true horseback enthusiasts, the ones that are in the saddle day after day, and work in companionship with their trusted steed. Each ring is sold separately. Proudly made in the U.S.A.
Beautiful sterling silver ring. Stylized horseshoe detail. Versatile - wear as a wedding ring or as a stylish accessory. Available in a wide range of men's & women's sizes. Comfort fit; order by ring size. Handcrafted jewelry, each piece is unique. Not just for weddings - our horseshoe wedding ring can also be worn as an attractive western accessory. Each ring is sold separately. Proudly made in the U.S.A. Horseshoe design ring with turquoise chip inlay. Beautiful sterling silver band. Versatile - wear as a wedding ring or as a stylish accessory. Available in a wide range of men's & women's sizes. Comfort fit; order by ring size. Handcrafted jewelry, each piece is unique. If your devotion to horses is just shy of your devotion to each other, then these equestrian-inspired wedding bands are perfect for the two of you. Sold separately. Proudly made in the U.S.A.
MORE Horse Jewelry at Horse.com and Back In The Saddle Gifts & Apparel.